When it comes to media, the more things change the more they stay the same. With an ever expanding array of devices, platforms and content formats, how can a marketer know where to place their message so that it reaches their target audience and gets noticed. 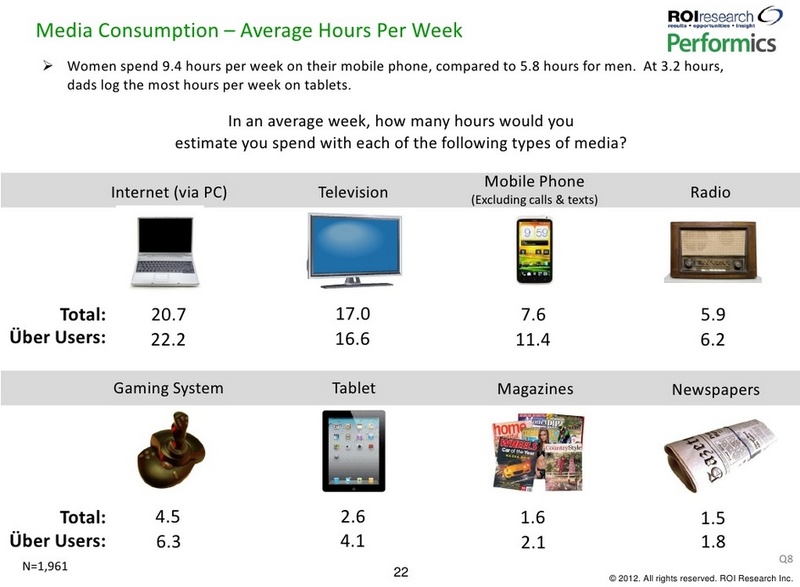 Across media devices, we consume an average of 61.4 hours a week (8.8 hours a day) of content based on research by Performics and ROI Research. That’s over one third of our time each week, or more than half of our waking hours, assuming eight hours of sleep. 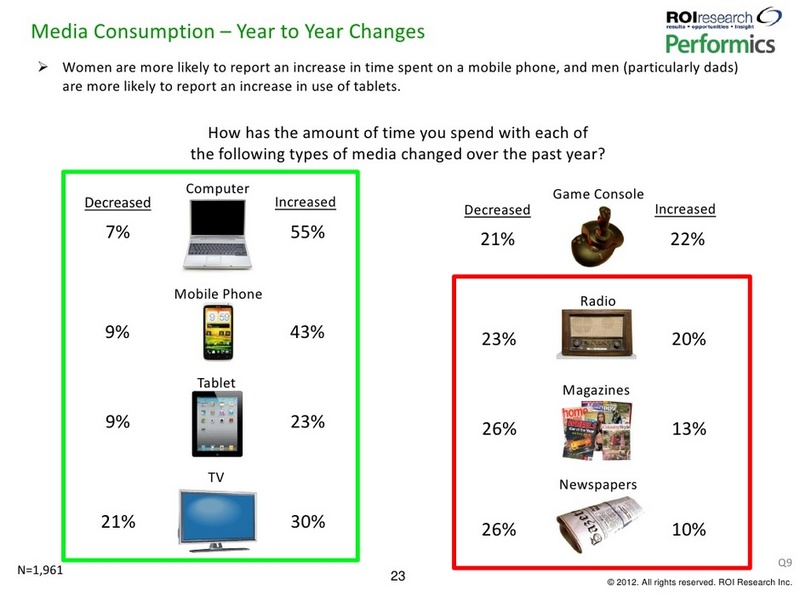 Despite the introduction and growth of computers, smartphones and tablets, television still commands slightly more than a quarter of our media time. What’s interesting is that despite the proportion of work time spent on a computer, computer usage is slightly more than four hours a day, assuming it’s only used five days a week. 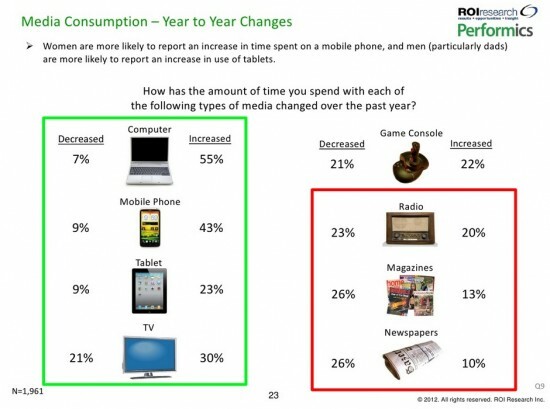 In terms of year-over-year changes, the research shows a net increase for digital devices and a net decrease for traditional media. The content consumed on devices with a high level decrease has most likely moved to digital devices where it can be time shifted and consumed-on-the-go. The ability to use digital televisions to project a variety of content including traditional television shows, movies and computer content as well as on-demand and time shifted capabilities has created higher demand and more efficient time usage. 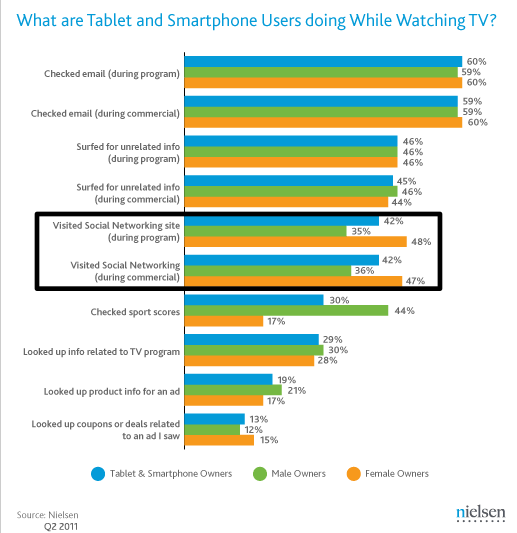 Based on the Performics-ROI Research, as a digital device, television is surprisingly absent. What’s missing from this device and content consumption analysis? Here are three important elements worth considering in your marketing plans. E-readers. These devices are changing how we consume long-form text content but aren’t included in this diverse device roundup. While many tablet and smartphone owners use their devices to read books and other content, e-readers are targeted content consumption devices. Among the content that owners use them for are newspapers and magazines. 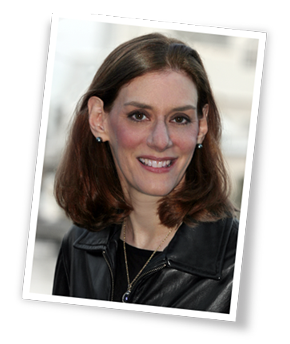 Where appropriate, marketers should consider long-form content in e-reader format. Television and social media. Social media has helped appointment television through the use of cross promotion of social media interaction (particularly Twitter which can spoil delayed viewing) and offering additional and supplemental social media content oriented for television screens. Additionally, there are social media destinations like Get Glue, and social media enabled television viewing. What socialized content marketing means for your marketing. Here are three tips to ensure your content marketing can break through the clutter. Create content across devices where appropriate based on your marketing persona. Don’t assume that one size fits all. Plan ahead to minimize size differences. 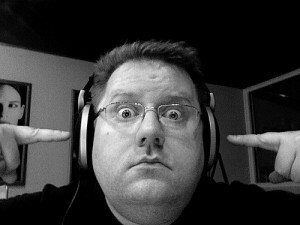 Need content marketing help? Here’s a useful checklist for your content creation. Enable content to be consumed quickly through appropriate formatting. 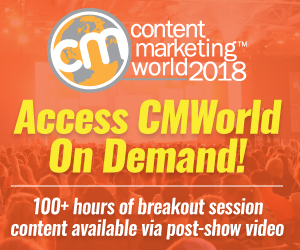 Anticipate that concurrent usage will continue to be a significant trend requiring that your audience be able to grasp your content intent quickly. Expect these device and content trends to continue. To this end, you must think integrated content and social media engagement across the devices where your target audience spends their time. 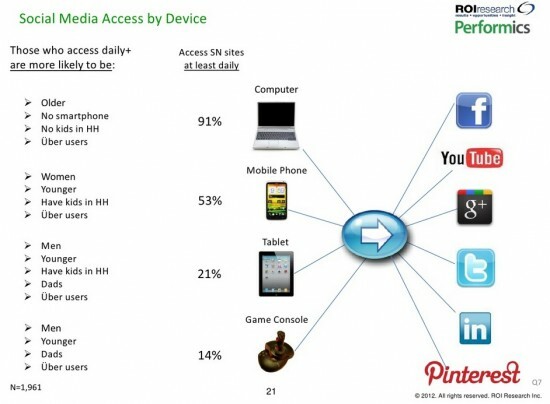 Where do you see the device and content marketing mix leading? What role will social media play? Tags Chart, Research, smartphone, Tablet, television. Bookmark the permalink.